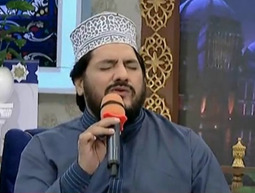 Zulfiqar Ali is a famous Naat Khawn. The reason of his popularity was his impressive and simple personality. He earned great respect and appreciation due to his unique way of reciting Naats. Zulfiqar Ali has awarded with a great voice by Allah Subhan o Tala. Hamariweb is providing his some most famous Naats online. Listen Online Naats of Zulfiqar Ali, Without any Media Player Required. Zulfiqar Ali Naats play with a beautiful way of recite. Zulfiqar Ali has a beautiful Voice and great style to speak naats. You can easily Listen Naat and free Download Naats of Zulfiqar Ali in Mp3 Format. Assalamualaikum. Marvellous naat. May Allah bless him with many gifts.